Monitoring deep ocean temperatures using low-frequency ambient noise. In order to precisely quantify the ocean’s heat capacity and influence on climate change,it is important to accurately monitor ocean temperature variations, especially in the deep ocean (i.e. at depths ~1000m) which cannot be easily surveyed by satellite measurements. To date, deep ocean temperatures are most commonly measured using autonomous sensing floats (e.g. Argo floats).However, this approach is limited because, due to costs and logistics, the existing global network of floats cannot sample the entire ocean at the lower depths. On the other hand, acoustic thermometry (using the travel time of underwater sound to infer the temperature of the water the sound travels through) has already been demonstrated as one of the most precise methods for measuring ocean temperature and heat capacity over large distances (Munk et al., 1995; Dushaw et al., 2009; The ATOC Consortium, 1998). However, current implementations of acoustic thermometry require the use of active, man-made sound sources. Aside from the logistical issues of deploying such sources, there is also the ongoing issue of negative effects on marine animals such as whales. An emerging alternative to measurements with active acoustic sources is the use of ambient noise correlation processing, which uses the background noise in an environment to extract useful information about that environment. For instance, ambient noise correlation processing has successfully been used to monitor seismically-active earth systems such as fault zones (Brenguier et al., 2008) and volcanic areas (Brenguier et al., 2014). In the context of ocean acoustics (Roux et al., 2004; Godin et al., 2010; Fried et al., 2013), previous studies have demonstrated that the noise correlation method requires excessively long averaging times to reliably extract most of the acoustic travel-paths that were used by previous active acoustic thermometry studies (Munk et al., 1995). Consequently, since this averaging time is typically too long compared to the timescale of ocean fluctuations (i.e., tides, surface waves, etc. ), this would prevent the application of passive acoustic thermometry using most of these travel paths (Roux et al., 2004; Godin et al., 2010; Fried et al., 2013). However, for deep ocean propagation, there is an unusually stable acoustic travel path, where sound propagates nearly horizontally along the Sound Fixing and Ranging (SOFAR) channel. The SOFAR channel is centered on the minimum value of the sound speed over the ocean depth (located at ~1000 m depth near the equator) and thus acts as a natural pathway for sound to travel very large distances with little attenuation (Ewing and Worzel, 1948). In this research, we have demonstrated the feasibility of a passive acoustic thermometry method use in the deep oceans, using only recordings of low-frequency (f~10 Hz) ambient noise propagating along the SOFAR channel. This study used continuous recordings of ocean noise from two existing hydroacoustic stations of the International Monitoring System, operated by the Comprehensive Nuclear-Test-Ban Treaty Organization, located respectively next to Ascension and Wake Islands (see Fig. 1(a)). Each hydroacoustic station is composed of two triangular-shaped horizontal hydrophone arrays (Fig. 1(b)), separated by L~130 km, which are referred to hereafter as the north and south triads. The sides of each triad are ~2 km long and the three hydrophones are located within the SOFAR channel at depth ~1000 m. From year to year, the acoustic waves that propagate between hydrophone pairs along the SOFAR channel build up from distant noise sources whose paths intersect the hydrophone pairs. In the low-frequency band used here (1-40 Hz) -with most of the energy of the arrivals being centered around 10 Hz- these arrivals are known to mainly originate from ice-breaking noise in the Polar regions (Chapp et al., 2005; Matsumoto et al., 2014; Gavrilov and Li, 2009; Prior et al., 2011). The angular beams shown in Fig. 1a illustrate a simple estimate of the geographical area from which ice-generated ambient noise is likely to emanate for each site (Woolfe et al., 2015). FIG. 1. (a) Locations of the two hydroacoustic stations (red dots) near Ascension and Wake Islands. (b) Zoomed-in schematic of the hydrophone array configurations for the Ascension and Wake Island sites. Each hydroacoustic station consists of a northern and southern triangle array of three hydrophones (or triad), with each triangle side having a length ~ 2 km. The distance L between triad centers is equal to 126 km and 132 km for the Ascension Island and Wake Island hydroacoustic stations, respectively. Acoustic thermometry estimates ocean temperature fluctuations averaged over the entire acoustic travel path (in this case, the entire depth and length of the SOFAR channel between north and south hydrophone triads) by leveraging the nearly linear dependence between sound speed in water and temperature (Munk et al., 1995). Here the SOFAR channel extends approximately from 390 m to 1350 m deep at the Ascension Island site and 460 m to 1600 m deep at the Wake Island site, as determined from the local sound speed profiles and the center frequency (~10 Hz) of the SOFAR arrivals. We use passive acoustic thermometry is used to monitor the small variations in the travel time of the SOFAR arrivals over several years (8 years at Ascension Island, and 5 years at Wake Island). To do so, coherent arrivals are extracted by averaging cross-correlations of ambient noise recordings over 1 week at the Wake and Ascension Island sites. The small fluctuations in acoustic travel time are converted to deep ocean temperature fluctuations by leveraging the linear relationship between change in sound speed and change in temperature in the water (Woolfe et al., 2015). These calculated temperature fluctuations are shown in Fig. 2, and are consistent with Argo float measurements. At the Wake Island site, where data are measured only over 5 years, the Argo and thermometry data are found to be 54% correlated. Both data indicate a very small upward (i.e. warming) trend. The Argo data shows a trend of 0.003 °C /year ± 0.001 °C/ year, for 95% confidence interval, and the thermometry data shows a trend of 0.007 °C /year ± 0.002 °C/ year, for 95% confidence interval (Fig. 2(a)). 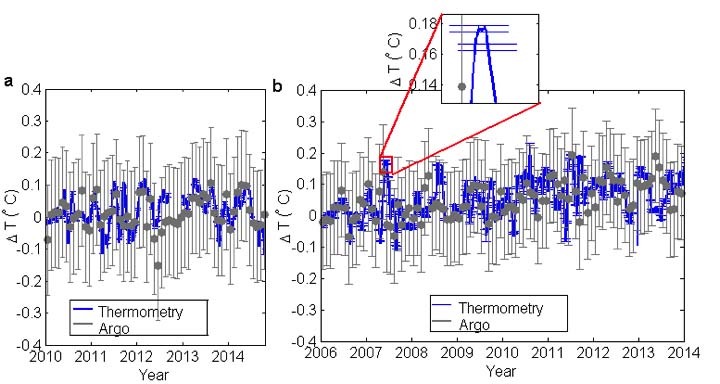 On the other hand, for the Ascension site, the SOFAR channel temperature variations measured over a longer duration of eight years from passive thermometry and Argo data are found to be significantly correlated, with a 0.8 correlation coefficient. Furthermore, Fig. 2(b) indicates a warming of the SOFAR channel in the Ascension area, as inferred from the similar upward trend of both passive thermometry (0.013 °C /year ± 0.001 °C/ year, for 95% confidence interval) and Argo (0.013 °C/ year ± 0.004 °C/ year, for 95% confidence interval) temperature variation estimates Hence, our approach provides a simple and totally passive means for measuring deep ocean temperature variations, which could ultimately significantly improve our understanding of the role of oceans in climate change. FIG. 2. (a) Comparison of the deep ocean temperature variations at the Wake Island site estimated from passive thermometry (blue line) with Argo float measurements (grey dots), along with corresponding error bars (Woolfe et al., 2015). (b) Same as (a), but for the Ascension Island site. Each ΔT data series is normalized so that a linear fit on the data would have a y-intercept at zero. The ATOC Consortium, (1998). “Ocean Climate Change: Comparison of Acoustic Tomography, Satellite Altimetry, and Modeling”, Science. 281, 1327-1332. Brenguier, F., Campillo, M., Takeda, T., Aoki, Y., Shapiro, N.M., Briand, X., Emoto, K., and Miyake, H. (2014). “Mapping Pressurized Volcanic Fluids from Induced Crustal Seismic Velocity Drops”, Science. 345, 80-82. Brenguier, F., Campillo, M., Hadziioannou, C., Shapiro, N.M., Nadeau, R.M., and Larose, E. (2008). “Postseismic Relazation Along the San Andreas Fault at Parkfield from Continuous Seismological Observations.” Science. 321, 1478-1481. Chapp, E., Bohnenstiehl, D., and Tolstoy, M. (2005). “Sound-channel observations of ice-generated tremor in the Indian Ocean”, Geochem. Geophys. Geosyst., 6, Q06003. Dushaw, D., Worcester, P., Munk, W., Spindel, R., Mercer, J., Howe, B., Metzger, K., Birdsall, T., Andrew, R., Dzieciuch, M., Cornuelle, B., Menemenlis, D., (2009). “A decade of acoustic thermometry in the North Pacific Ocean”, J. Geophys., 114, C07021. Ewing, M., and Worzel, J.L., (1948). “Long-Range Sound Transmission”, GSA Memoirs. 27, 1-32. Fried, S., Walker, S.C. , Hodgkiss, W.S. , and Kuperman, W.A. (2013). “Measuring the effect of ambient noise directionality and split-beam processing on the convergence of the cross-correlation function”, J. Acoust. Soc. Am., 134, 1824-1832. Gavrilov, A., and Li, B. (2009). “Correlation between ocean noise and changes in the environmental conditions in Antarctica” Proceedings of the 3rd International Conference and Exhibition on Underwater Acoustic Measurements: Technologies and Results. Napflion, Greece, 1199. Godin, O., Zabotin, N., and Goncharov, V. (2010). “Ocean tomography with acoustic daylight,” Geophys. Res. Lett. 37, L13605. Matsumoto, H., Bohnenstiehl, D., Tournadre, J., Dziak, R., Haxel, J., Lau, T.K., Fowler, M., and Salo, S. (2014). “Antarctic icebergs: A significant natural ocean sound source in the Southern Hemisphere”, Geochem. Geophys., 15, 3448-3458. Munk, W., Worcester, P., and Wunsch, C., (1995) .Ocean Acoustic Tomography, Cambridge University Press, Cambridge, 1-28, 197-202. Prior, M., Brown, D., and Haralabus, G., (2011), “Data features from long-term monitoring of ocean noise”, paper presented at Proceedings of the 4th International Conference and Exhibition on Underwater Acoustic Measurements, p. L.26.1, Kos, Greece. Roux, P., Kuperman, W., and the NPAL Group, (2004). “Extracting coherent wave fronts from acoustic ambient noise in the ocean,” J. Acoust. Soc. Am, 116, 1995-2003. Woolfe, K.F., Lani, S., Sabra, K.G., and Kuperman, W.S. (2015). “Monitoring deep ocean temperatures using acoustic ambient noise”, Geophys. Res. Lett., DOI: 10.1002/2015GL063438.